Thousands of visitors make their way to Ludington State Park in Mason County each year, where sandy beaches, large campgrounds, miles of hiking trails, sand dunes and more await. This has become one of our favorite places to camp in the Lower Peninsula, and we shared some of our favorite pictures in our Photo Gallery Friday: Ludington State Park post. 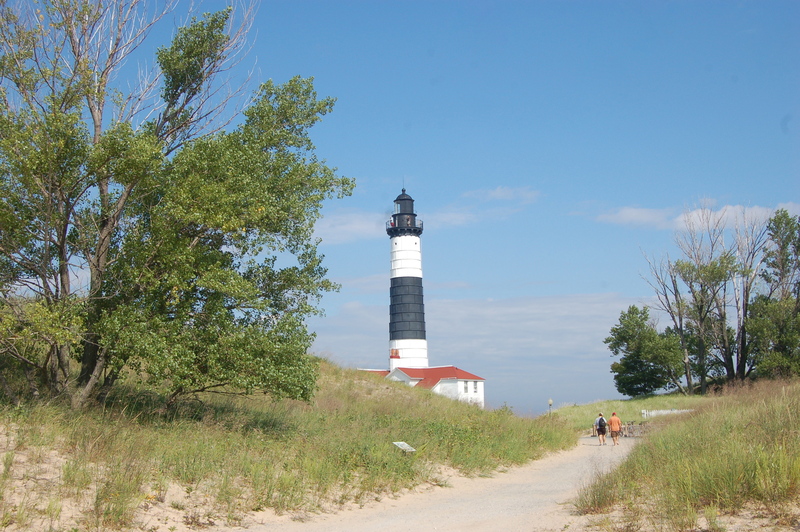 One of the highlights of a visit to the park is seeing the Big Sable Point Lighthouse, one of the tallest beacons on Lake Michigan. 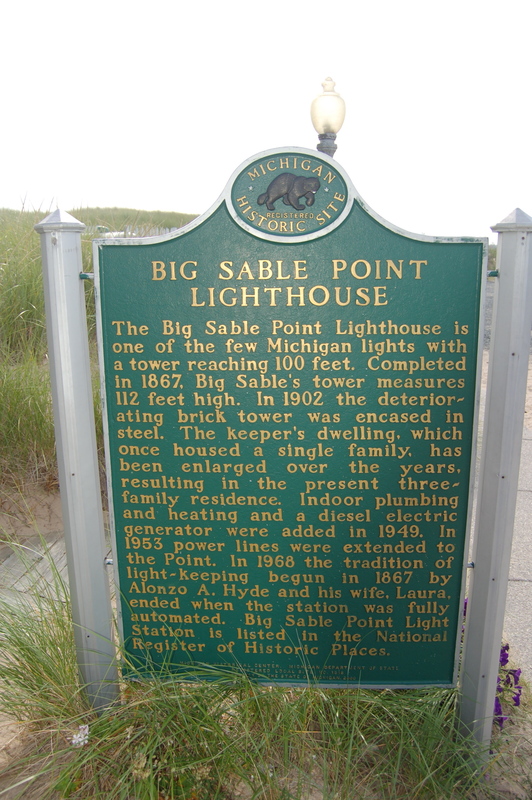 We recently included Big Sable on our list of 16 Michigan Lighthouses You Should Visit In 2016. 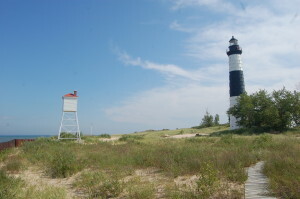 The Big Sable Point Lighthouse was constructed and first lit in 1867. The tower was made of Cream City Brick like many others in the state, but after struggles with deterioration from the elements it was covered with sheet metal plates. The white tower has a black band in the middle, and is capped with a lantern room that is painted black as well. At 112 feet, this is Michigan’s third-tallest lighthouse and the tallest on the mainland (Rock of Ages Light at Isle Royale is 130 feet tall and the White Shoal Light in the Straits of Mackinac is 121 feet tall). 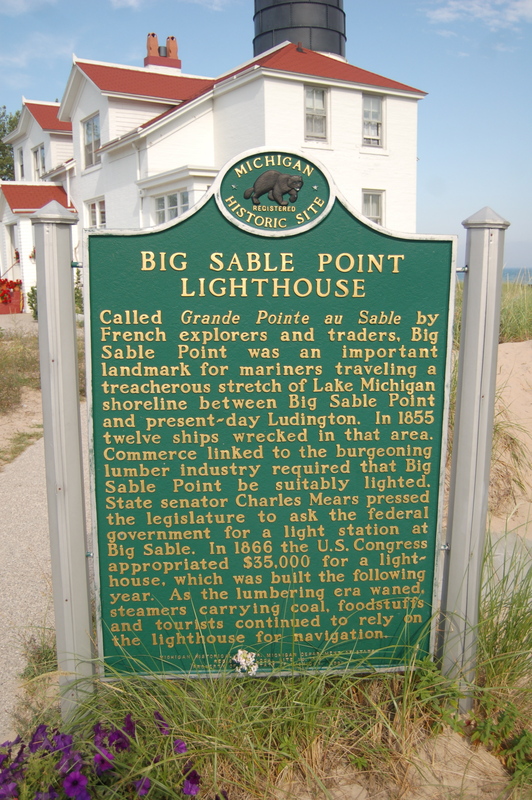 Called Grande Pointe au Sable by French explorers and traders, Big Sable Point was an important landmark for mariners traveling a treacherous stretch of Lake Michigan shoreline between Big Sable Point and present-day Ludington. In 1855 twelve ships wrecked in that area. 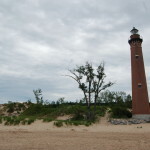 Commerce linked to the burgeoning lumber industry required Big Sable Point be suitably lighted. 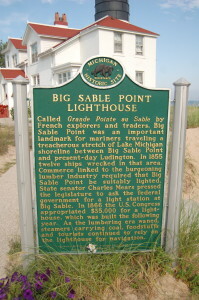 State Senator Charles Mears pressed the legislature to ask the federal government for a light station at Big Sable. In 1866 the U.S. Congress appropriated $35,000 for a lighthouse, which was built the following year. As the lumbering era waned, steamers carrying coal foodstuffs and tourists continued to rely on the lighthouse for navigation. 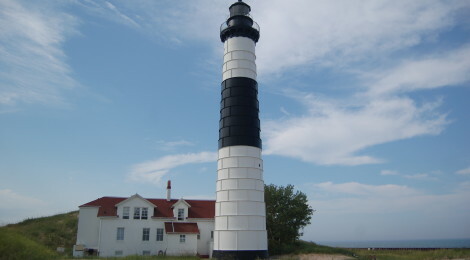 The Big Sable Point Lighthouse is one of the few Michigan lights with a tower reaching 100 feet. Completed in 1867 Big Sable’s tower measured 112 feet high. In 1902 the deteriorating brick tower was encased in steel. The keeper’s dwelling, which once housed a single family, has been enlarged over the years, resulting in the present three-family residence. Indoor plumbing and heating and a diesel electric generator were added in 1949. In 1953 power lines were extended to the Point. 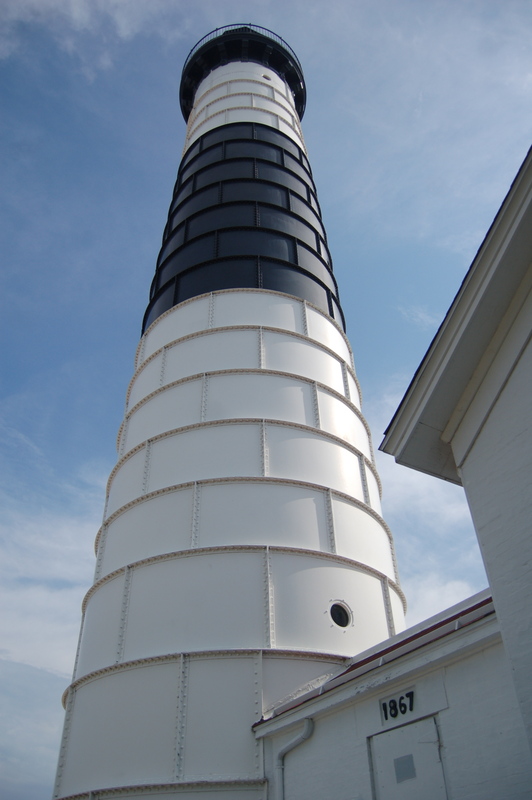 In 1966 the tradition of light-keeping begun in 1867 by Alonzo A. Hyde and his wife Laura ended when the station was fully automated. 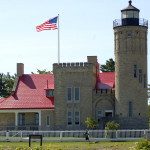 Big Sable Point Light Station is listed in the National Register of Historic Places. 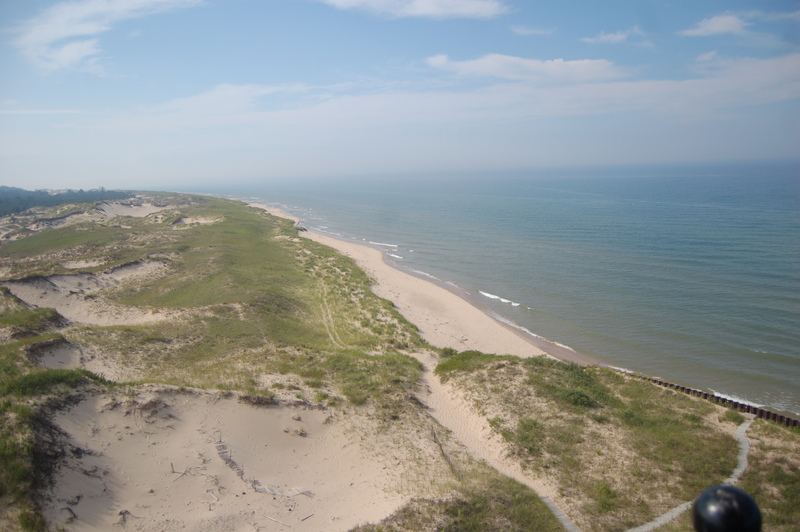 Thanks to the efforts of the Sable Points Lighthouse Keepers Association, the lighthouse and dwelling have been restored, and it is possible to climb to the top of the tower in the summer months. Find out more at http://www.splka.org/lights.html. 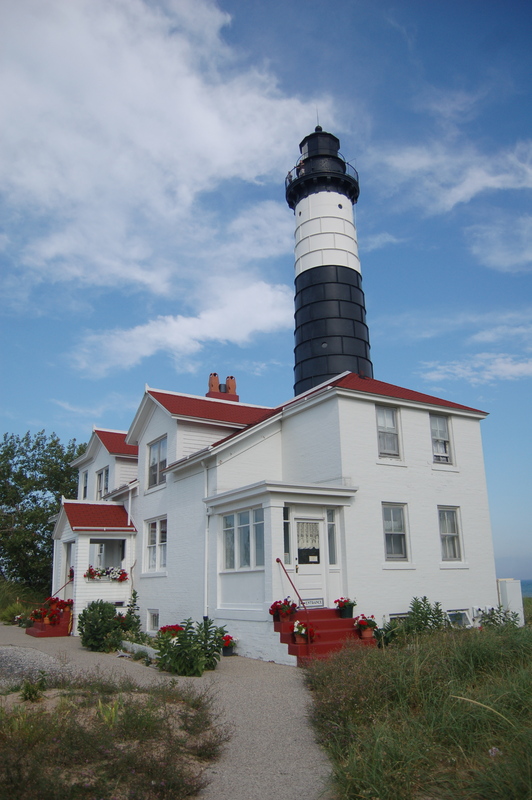 The SPLKA also offers tours of Little Sable Point Light at Silver Lake State Park, White River Light Station, and the Ludington North Pierhead Light. 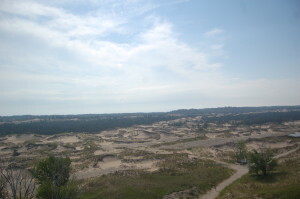 Above and below this paragraph you can see our pictured from the top of the Big Sable tower, looking out at Lake Michigan and looking back at the dunes in the state park. 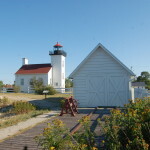 To get to the lighthouse there are a couple of options, but plan on a hike of at least a mile no matter what. It is possible to take the longer but incredibly scenic route that simply follows the beach from the day use parking area, but that is a taxing and longer trek. The Lighthouse Trail starts in the northwest corner of the Pines campground loop, and it a mostly flat trip on a wide road (bus service is offered on select days for those who can’t make the hike). 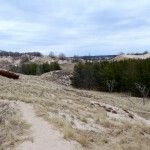 A full trail map is helpful when navigating the park’s more than 21 miles of hiking opportunities, and it shows the numerous other ways to get to the lighthouse from the Beechwood or Cedar campgrounds or from the other day use areas near Hamlin Lake. Ludington State Park headquarters are at 8800 M-116 north of Ludington, and the parking for day use and the campground entrance are a couple miles to the north. Combined, the campgrounds offer more than 350 sites.